In Part 1, we discussed the potential bird flu pandemic that is already causing panic in parts of Asia & Europe. What about the economic implications? Since worldwide vaccination would be impossible to achieve in enough time to contain the spread of the virus, everything would shut down & residents would be confined to their homes for months. During a nationwide quarantine, the economy would be brought to a standstill. It doesn't take a genius to predict how the financial markets will react during this time. Remember September 11th? A Stage 6 pandemic would be even worse. Unlike the terrorist attacks in 2001, this disaster would be worldwide with higher death tolls, more fear & longer recovery time. The stock market would plummet. Not surprisingly, people are already profiting from this anticipated dooms-day scenario. A quick search of "Bird Flu" on Google will show you how many scam artists are already trying to capitalize on the fear of the public. You can purchase protective masks, diagnostic kits, and even non-FDA approved drugs for treatment. To hedge your bets during this potential disaster, you should seriously consider the following companies. The list includes companies with late-stage H5N1 vaccines, companies with considerable federal funding, and more indirect plays such as beef producers and FDA-approved test kit manufacturers. Not only will they perform well after the virus reaches the United States, but also in anticipation of that day. Please note: I have omitted the obvious choices such as Roche (maker of Tamiflu), GlaxoSmithKline, Novartis and Sanofi-Aventis. While all 4 are already in the process of producing vaccines, their size (>$100 billion) will largely inhibit any positive effect. In addition, I have omitted most companies with early-stage H5N1 vaccinations. While there are many drug companies in the process of creating a potential vaccine, anyone who has ever invested in the Pharmaceutical Industry will realize how much of a crap shoot these drugs can be in the preliminary stages. The latest beneficiary of taxpayer generosity is Chiron, which was just awarded a $62.5 million contract by the U.S. Department of Health & Human Services. The goal is to develop a new vaccine and have 20 million doses on hand to prevent people from getting infected with H5N1. The bird flu vaccine contract represents a significant influx of money to Chiron, and the government says it expects the company to develop and deliver the vaccine by early this year. 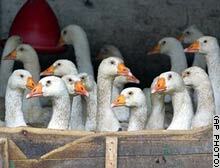 Three independent laboratories have confirmed that its new drug, Neugene, appears effective in fighting H5N1 flu. The company now plans to file with the Food and Drug Administration to begin human clinical trials. Shares of Quidel skyrocketed in late December after the medical test maker said its QuickVue flu test not only showed high rates of accuracy in a recent study but can also detect the virus that causes avian flu. The company said an Australian study of its 10-minute QuickVue Influenza A+B test over the continent's summer flu season accurately diagnosed the presence of Type A flu virus 96 percent of the time and the absence of flu virus 97 percent of the time. In an earlier study conducted in Hong Kong and Japan, the test was shown to be able to detect the H5N1 virus. Simple: As demand for chicken plummets after United States first confirmed case (yet to happen as of this publication date), Pork demand will explode. Premium Standard was poised for a turnaround regardless of the bird flu. It appears the H5N1 flu vaccines will be produced the conventional way using egg embryos. Once the specific strain is found after human-to-human mutation, governments won't be able to make vaccines quick enough. Egg producers such as Cal-Maine will be in high demand. In January, BCRX said the FDA had granted "fast track" designation for Peramivir injection in the treatment of influenza infections, including highly virulent, life-threatening strains of influenza. In December, the company received FDA approval to begin human clinical trials using injectable Peramivir. The Amex-traded Beijing company signed an agreement last December with the Chinese Center of Disease Control & Prevention to accelerate development of an avian flu vaccine. Its shares have doubled since January. In late August 2005, Novavax reported that preclinical data for its treatment of another avian flu strain, known as H9N2, looked promising in protecting animals. Its shares traded for less than a dollar in August. They have more than quadrupled since. EBAY/Amazon/Online retailors: During a nationwide quarantine when people are required to stay indoors, the majority of shopping will be done online. Videogame/Indoor leisure stocks: What else are you going to do indoors all day long? Precious Metals/Bonds/Cash: Money will travel to more secure investments such as Gold, Copper, Plantium, Fixed-Rate instruments & Cash money. It's interesting to see how many companies are poised to make some serious cash off of this looming disaster. To quote, it makes me "ponder the nature of the so-called Ethical or Socially Responsible Investing (SRI)." What about other doomsday scenarios (rising waters from global warming, nuclear disaster, chemical attack, etc)? Surely some company out there is profiting from those as well? It'd be interesting to see who's first in line to make money off other's misfortune. I've pondered the same (moral) conundrum myself. But I tried to separate the scams for the companies that will actually help save lives. Also, would one rather lose half their savings in a few months (worse-case scenario?) or fund companies that are attempting to find a cure that can potentially save thousands of lives? Like I said, if you type "Bird Flu" in Google, the right bar will give you 100s of companies already trying to scam those scared & naïve individuals. Most of the companies I profiled are smaller companies that are legitimately attempting to find a cure. Many will be busts as is typical of early-stage pharmaceutical companies, but a few will be saviors. QDEL, for instance, is giving away its first 10,000 detection & prevention kits away for free. I also left out the larger companies with obvious ties to government officials who are already reaping rewards. Gilead Sciences, for example, was run by Defense Secretary William Rumsfeld, developer of the top H5N1 therapy, before taking office. Shares are up 300% since the Bush administration began & he still owns roughly $2 million in stock. The Bush family is a large shareholder of Sanofi-Aventis. The moral dilemma is: Should investors feel guilty about correctly timing a future tragedy even while millions of people are dying? I don’t think that’s a fair question because you’re investing in those companies who are helping the cause.